Seven Stories Press, 9781609801397, 336pp. ANDREW LATIES co-founded Children’s Bookstore, Children’s Bookfair Company, Children’s Museum Store, Povertyfighters.com, and Eric Carle Museum Bookshop, and Vox Pop. He shared the 1987 Lucile Micheels Pannell Award for bringing children and books together. ED MORROW is co-founder of Northshire Bookstore in Manchester, Vermont, and has served as president of both the New England and the American Booksellers Associations. BILL AYERS is distinguished professor at University of Illinois, founder of Small Schools Workshop and Center for Youth and Society, and author of fifteen books on teaching and children’s rights. "Everything you always wanted to know about the book business but were afraid to ask." "Andy has put so much passion into his book that it is impossible to read before bed: the book incites a disturbing concoction of adrenalin and hormones that rages against that good night. Not only does Andy not go gently there, he refuses to go, period. This book is heartfelt and honest." "Andy Laties has been a huge inspiration to me and many of my fellow booksellers, and his passion is as galvanizing as his business models. 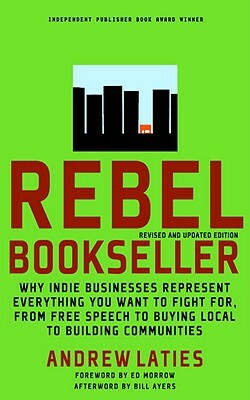 Not every one of his self-proclaimed wild ideas will make sense for every store or in every market (that's the nature of independents), but the very fact of someone out there turning received wisdom about the book business on its head, and thinking about things in truly new and optimistic ways, has made a difference that can be seen in the new crop of indie bookstores that has sprung up in recent years. We owe a lot to Andy for shaking things up, and I'm excited about this new edition getting out there and blowing the minds of even more book people."